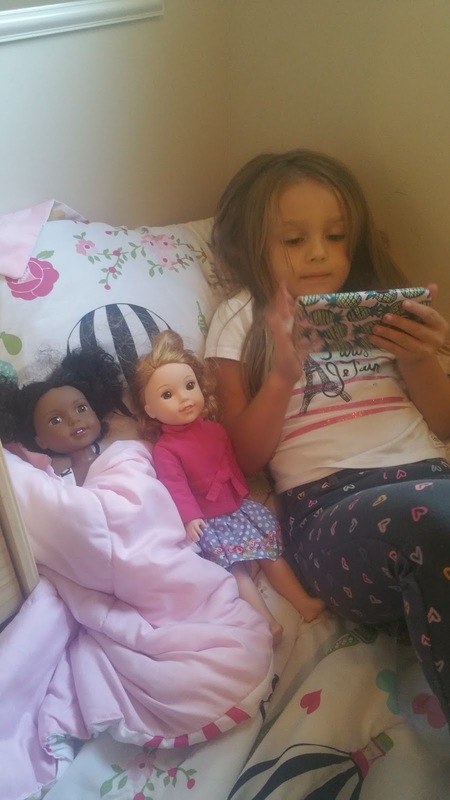 Growing up I loved American Girl dolls. I obsessed over Samantha and Molly. 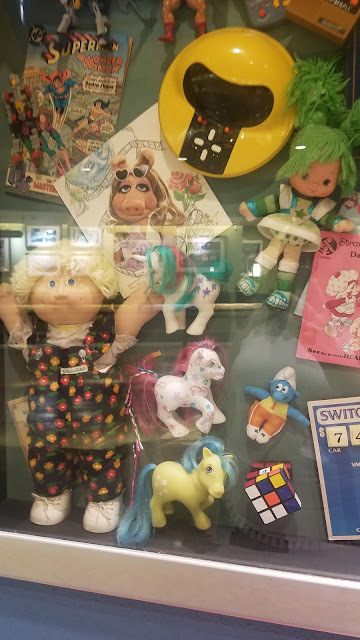 I loved their clothes and accessories and when the catalog would come in the mail, I would spend hours pouring over it, dreaming of owning one. 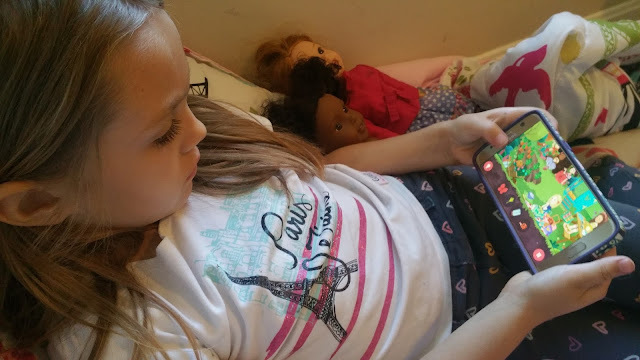 Now that I have my own daughter, she is also in love with American Girl dolls. 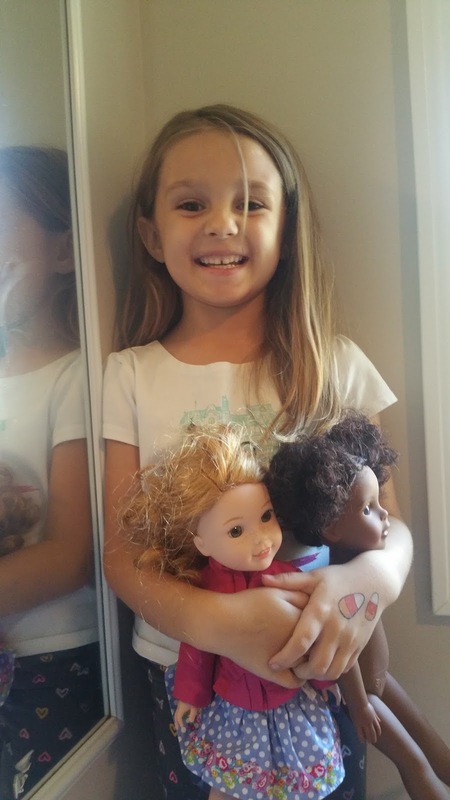 Her first doll was bought by my mother, with a full trip to the Natick American Girl store. A second was added with her second hand Emily doll. Then a Bitty Baby joined the party. Then American Girl introduced their new line of Wellie Wishers and Emma and I both fell in love. 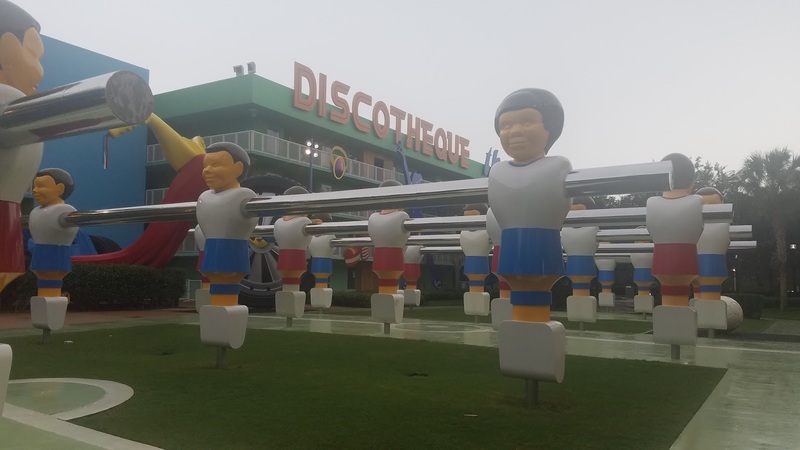 Instead of 18" soft body dolls, the Wellie Wishers are 14" hard body dolls. Their smaller bodies are a bit easier for Emma to play with. Emma already has 3 of the dolls, and is asking for another from Santa so we were especially excited when we were contacted to try out the new WellieWishers: Garden Fun Game. WellieWishers are a sweet and silly group of girls who each have the same big, bright wish: to be a good friend. 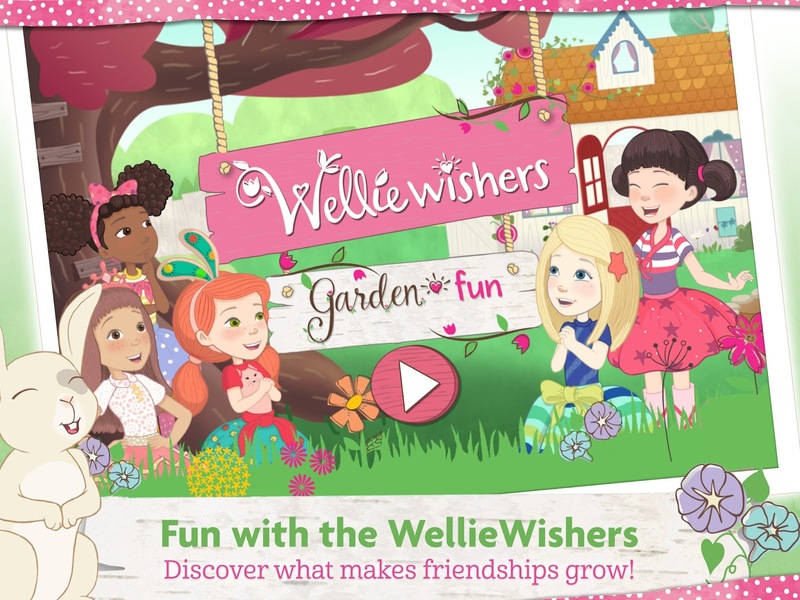 And now with the WellieWishers: Garden Fun app, little ones can learn how to be a good friend as they play. 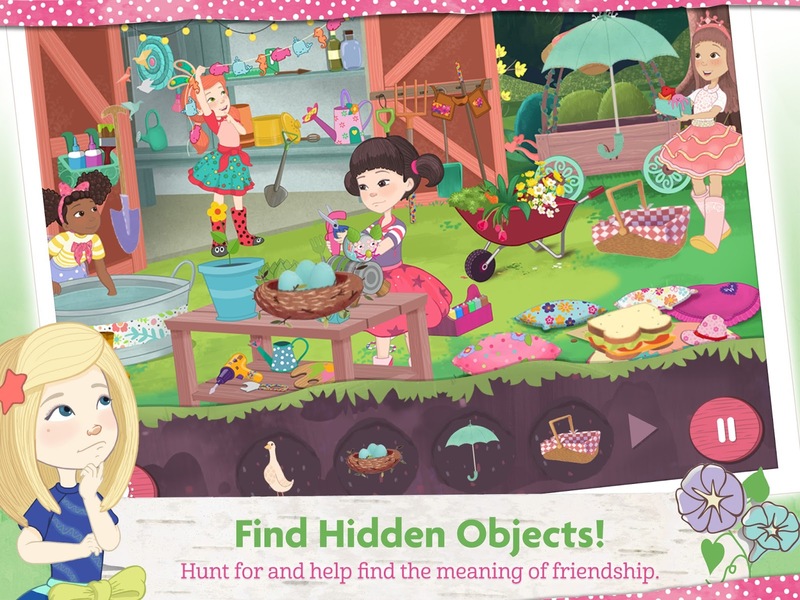 From hidden object and tea-party planning minigames to nurturing their own garden and customizing the backyard garden with stickers, little kids are invited to join the WellieWishers to discover what makes friendships grow. 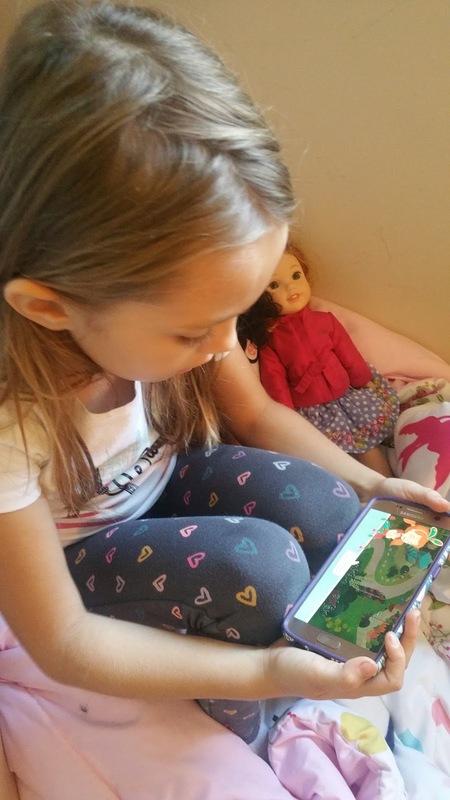 The content is tailored to kids ages 5-7, offering good-quality entertainment from a well-loved, trusted brand partner in American Girl. And, with school back in session, it’s a great opportunity to reinforce the values young ones are learning in class, so they can practice their caring and empathy skills while outside of preschool or elementary school. 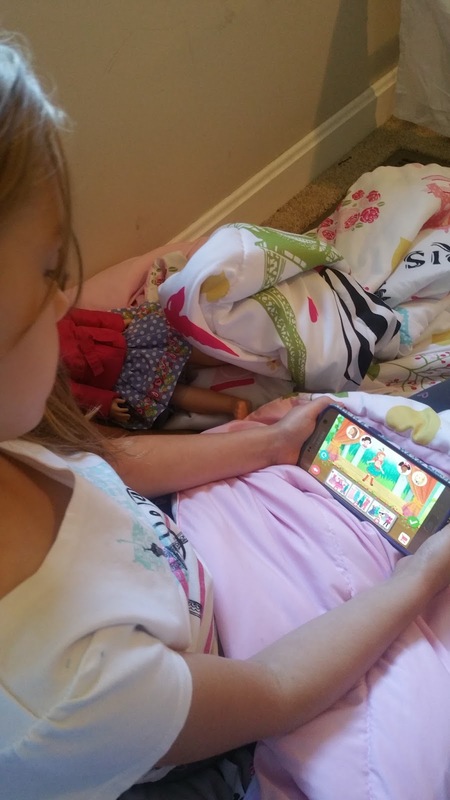 Even though American Girl is often marketed towards girls (even though they added a boy doll!) 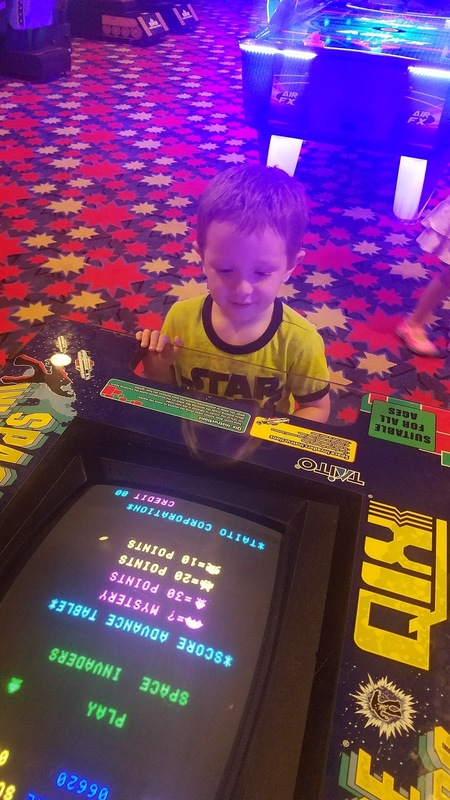 I love that both my boy and girl love the games. When we're at dance and waiting for Emmalee, Tyler often grabs my phone and starts to play. When we're in the grocery store, Tyler will take my phone from my bag and start to play. Thankfully, even though it's a game full of content, it doesn't destroy my battery! 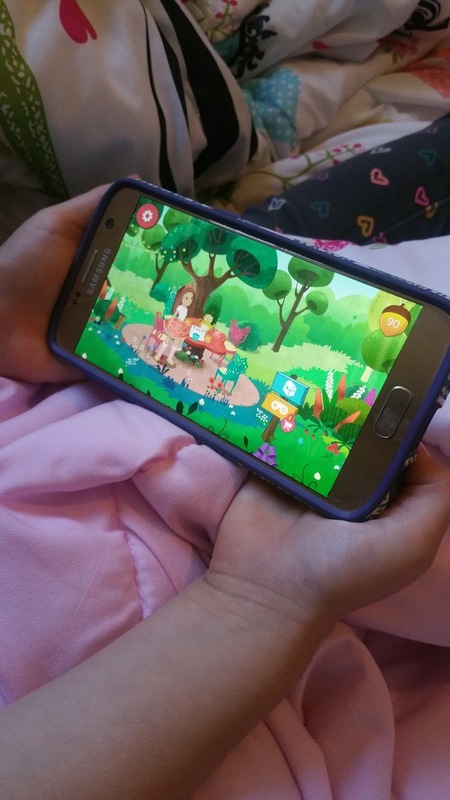 Each of the little games inside of the app offer creative content for kids. The app is free but some of the extra content does cost money (no more than $3 from Google Play!) My kids especially love finding the hidden objects game! 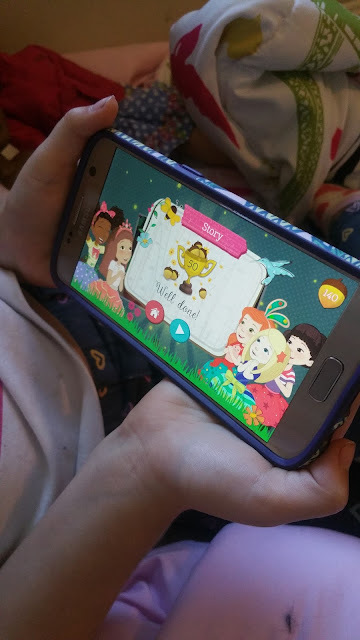 In a world full of technology and "scary things" on the internet, I love that American Girl has created an app that the kids love to play with that also encourages creative and empathy, just like the rest of the American Girl line does! Grab the app on iOS and Android today! Dress provided by Top Tier Style, however all thoughts and opinions are my own. We've finally reached some cooler temperatures up here in New England. It was only 50 degrees this morning! I actually love the Fall, the crispness in the air and the colors of the leaves changing... I love it. However, my favorite part of Fall is the clothes. I am obsessed with Fall wardrobes. Give me cardigans, knee high socks, and Hunter boots and I am a happy girl. As someone who is right in between a "normal" size and a "plus" size, it's not always easy to find clothes that fit the way I want them too. 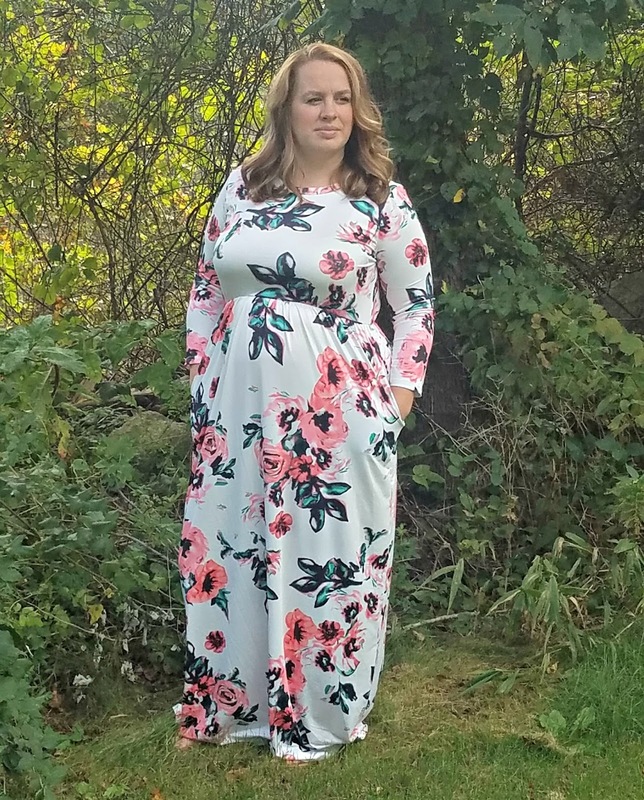 Many XLs in "normal" stores are too small but the smallest plus size clothing is still too big. It's so frustrating. Thankfully I discovered a new site called Top Tier Style. It has so much stuff. Like everything you might want to purchase as far as clothing is on that site. While there is not a distinct "Plus Size" section, many of the styles run into the 1X, 2X and 3X sizes. 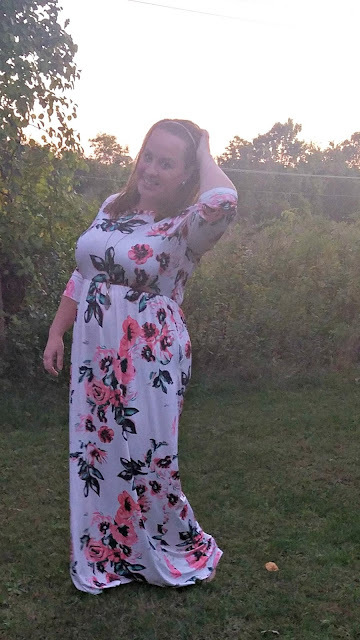 My favorite of these items was this gorgeous floral dress I found! Now I don't get dressed up often, but I love the versatility of this. It's simple enough to wear to work but fancy enough to wear out to dinner. 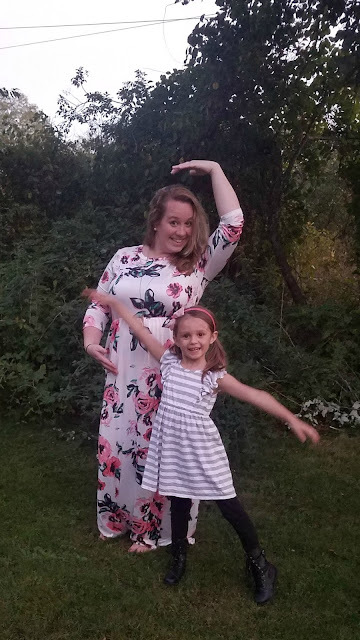 It's comfortable enough that I could even play and dance with Emmalee in it! I seriously want to order it in every colorway now and thanks to Top Tier Style's super easy and amazing return policy, it will be okay if it doesn't fit exactly as I hoped and will save me from a few more embarrassing dressing room comments! The bohemian dress in this review was provided by Top Tier Style. 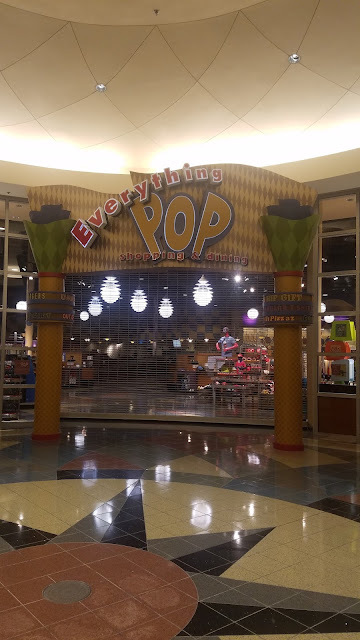 If you would like to purchase your own use the coupon code BLOG15 for 15% OFF everything on their store! Can I start off by saying I love that I have a job where I follow my dreams? You may or may not know that I just took a super scary jump and changed from the familiarity of teaching English to high school students to being a Special Education teacher for those same kids! 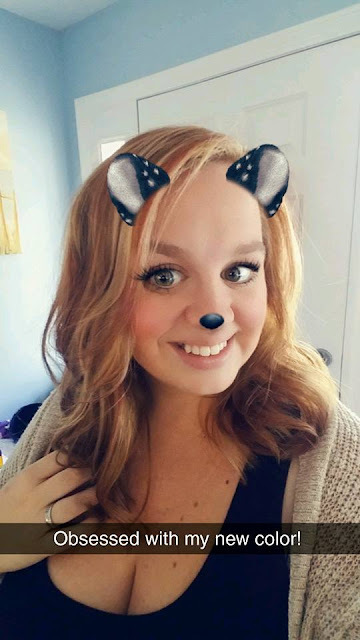 I've always wanted to get into Special Education, knowing that one day I want to be an administrator, but it's scary leaving something safe and comfortable for something unknown! 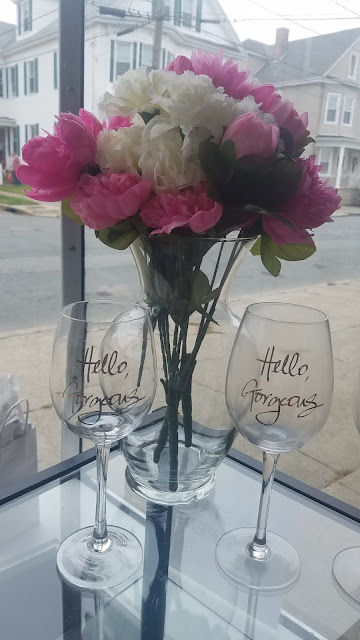 I'm super excited to announce that my friend also made a huge jump this year-- leaving education and opening up her own salon! Granted, she was a vocational teacher in the cosmetology department so it's not a huge jump... but owning your opening up your own business is crazy! 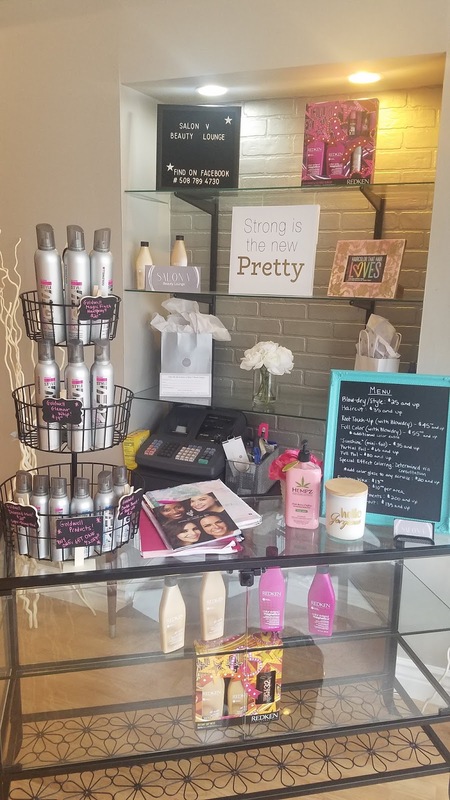 This isn't like me and my shampoo, you know, where it's just me and my box of samples in my living room... her new salon is a full out brick and mortar and I'm obsessed for her! Vanessa has been doing my hair for almost 2 years now. I fell in love with her and her love of color and haven't gone to anyone since. She's turned my hair a gorgeous ashy brown, a super fun platinum blonde, and even put pink streaks in my girl's hair! 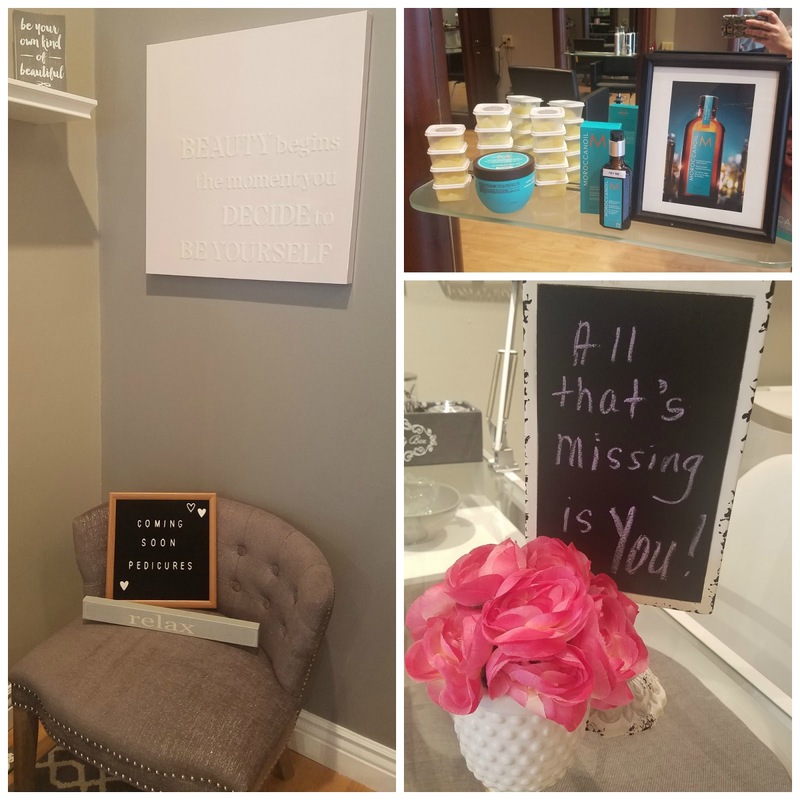 I trust her more than anyone else I know so I was determined to be one of her first clients in her new space! It's the perfect fall transition for my super blonde hair. In addition to hair, Vanessa offers waxing and it's the best ever. With super sensitive skin, I usually have to get my eyebrows done, you know the 4 times a year it happens, when I have no other plans for the day because I get so red and splotchy. Not this time! I don't know what magic miracle wax she uses but I was amazed at how little red there was and how quickly that small bit disappeared! I may be getting them done more often now! Vanessa has also hired an amazing staff who can give great cuts and manicures. Emma needs a cut soon and I imagine she'll love getting her nail done after! 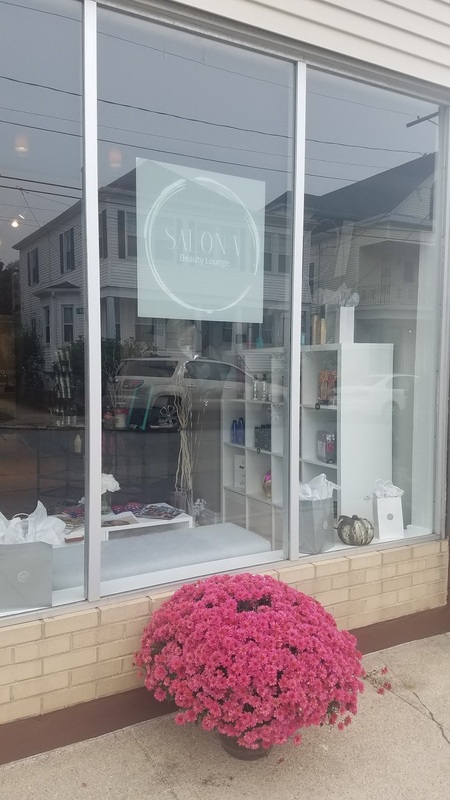 Salon V is located in New Bedford and you can check the salon out online at the Salon V Beauty Lounge Facebook Page. Let her know I sent you! If you're a parent, you know that in life, the kids end up with what they need, and usually want as well, before you end up with what you need. For the past year, Dave and I have been saying we need a new mattress. The mattress we have was purchased in January of 2010, making it almost 8 years old. Now most mattresses say they last between 5 and 10 years, but let's be honest- our moving in together decision was quick! 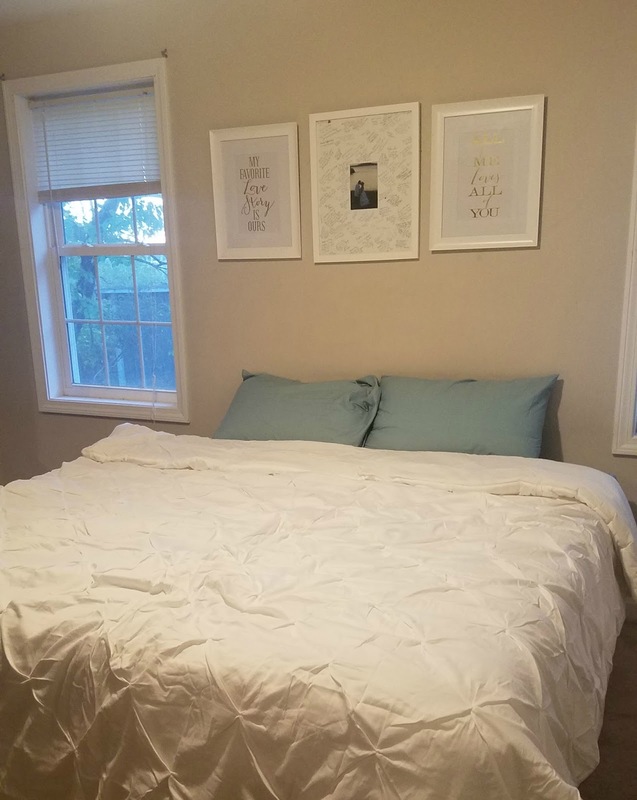 WE had planned to stay where we were: me, living basically rent free with my family and him living in an apartment with a super low rent with one of his friends for a few more months so when we decided on a Friday to move in together sooner and signed papers on Sunday for said apartment, we grabbed a cheap mattress. It fell apart quickly. There is currently a dent where each of us sleeps. We can feel the springs, even though it has an extra padded pillow top. 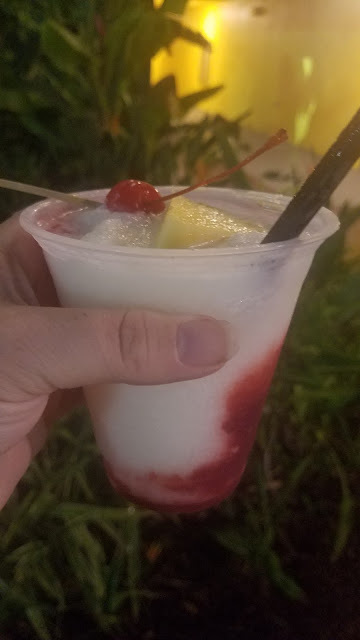 A full night's rest was no longer restful. Add in two kids who like to wake up at 5:30 am and crawl in for morning snuggles, it was time for a new, bigger bed. Also, do you know how hard it is to bring kids shopping? Like I literally do all of my shopping online (minus groceries) because keeping the two kids in tow, without fighting is worthy of a trophy in itself, never mind adding in a room full of bouncy, jump on me mattresses! I started researching online mattresses months ago. I read reviews, watched videos, and compared specs. I mean, I did research. And then I fell in love with Nectar Mattresses. 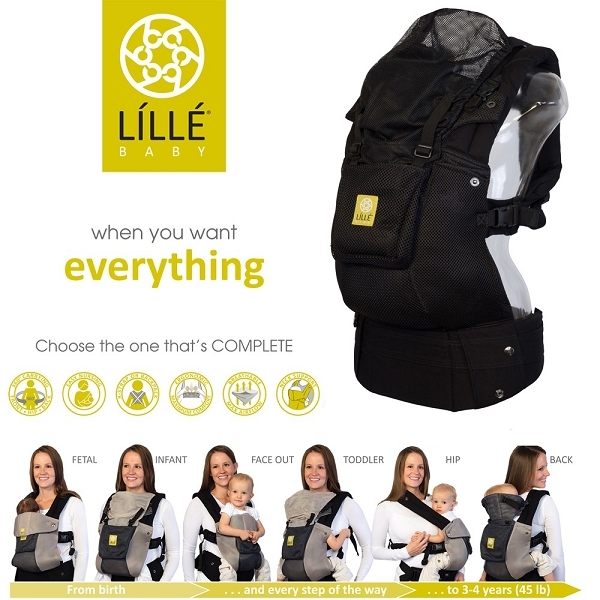 It offered an affordable price point, gives you a 365 night trial, free shipping and a forever warranty. For under $800 I could be sure that we had a mattress we love. Unfortunately, life gets in the way and before you know it the money you were going to use on a mattress went to dental costs, back to school items, and new tires so you can imagine my excitement when Nectar reached out asking if we'd like to try out their mattress! The mattress arrived a full week earlier than I was expecting, which to me was both amazing and stressful since we didn't have a bed frame for it yet! 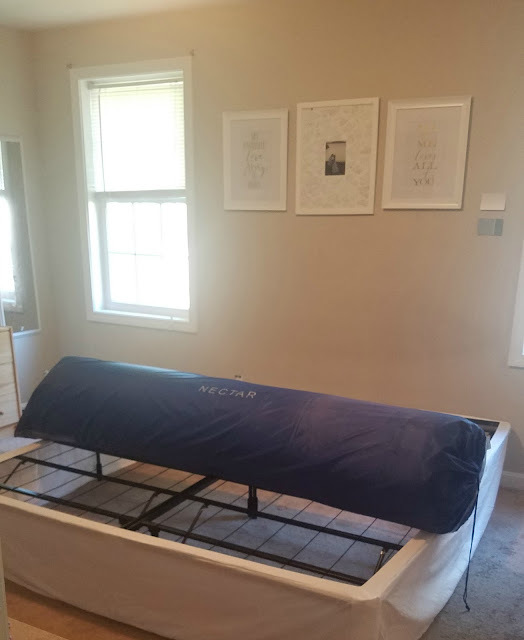 A quick order to Amazon for a simple bed frame and two days later we started to set up! The mattress itself arrives rolled up and compressed. The mattress felt heavy at 89 lbs, but the packaging does tell you to team lift and with the help of my husband, I was able to move it. Set up is a breeze. I mean, probably the easiest I've ever dealt with. 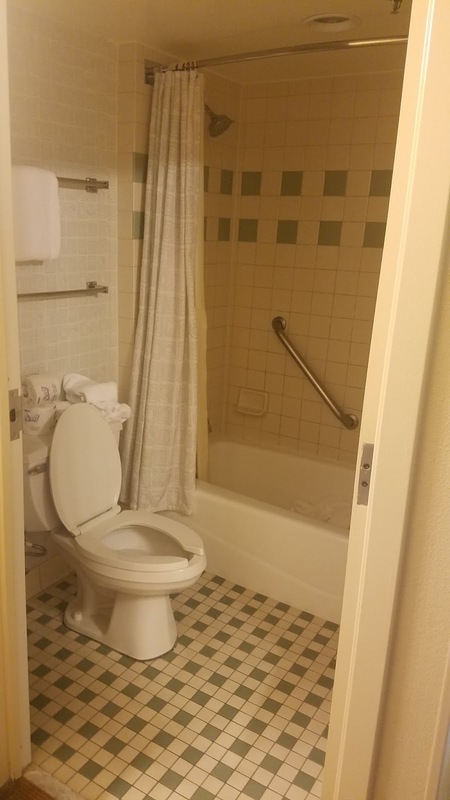 Because it is packaged up so tight, it was easy to maneuver down the hallway and into our bedroom. Honestly, with the angles we have, I'm not sure any other mattress would have made it in! We removed the outer packaging and laid the mattress as flat as we could get it on the bed frame. Then we took off the next set of packaging - super carefully! We even used the awesome tool they included so we didn't nick the bed. 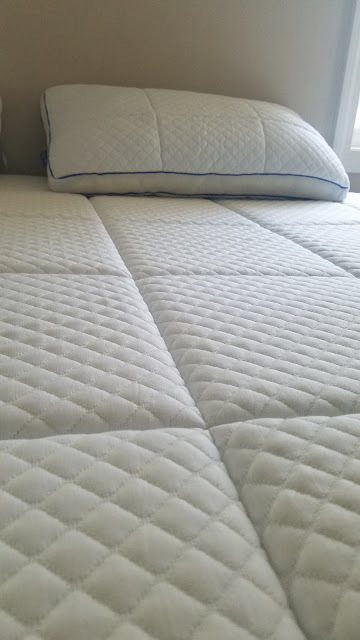 I was really impressed with the fact that there was no gross, chemical foam type smell that can be associated with these types of mattresses. I was a bit concerned at first though, because even though the packaging says it can take up to 3 days to fully get back to its original shape, it was looking a little flat. 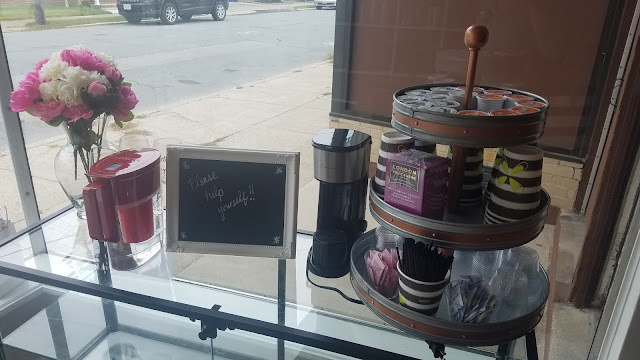 I left it alone for a couple hours and took the kids shopping. 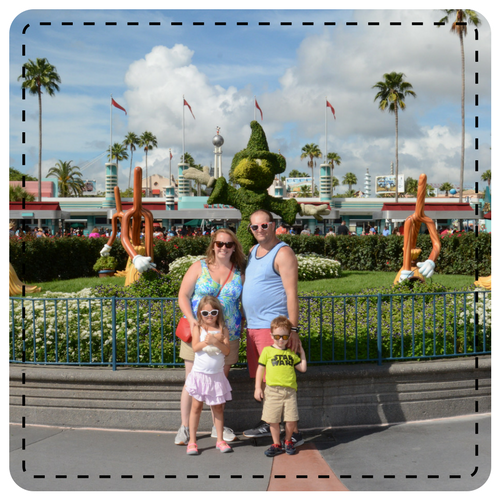 When we got back I could not believe how different it was! The mattress was thick and so comfortable! I like firmness to my mattress but I also like the feeling of sinking into my pillows and Nectar gave me exactly that. It's a medium firm mattress but the soft foam is so comfortable. The idea of ordering a mattress online, without ever trying it out was petrifying but I am so glad we did! I literally get the best sleep I've had and it's so ridiculously comfortable. Now that we have a new mattress, we needed new bed sheets, so now we're looking at paint colors- so I can't wait to share a full bedroom overhaul soon! 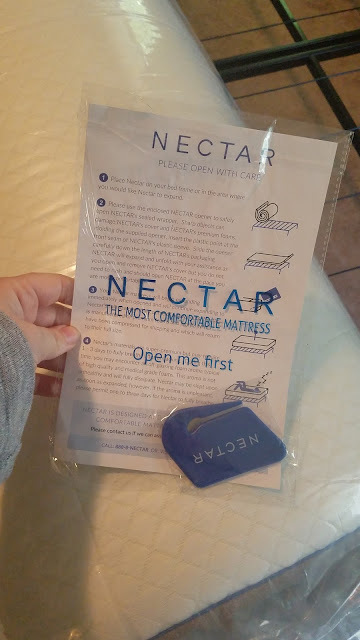 Be sure to check out Nectar mattresses and order one for yourself! With the 365 night trial-- you have nothing to lose! Click through on my affiliate link and be sure to let them know where you heard about Nectar mattresses! 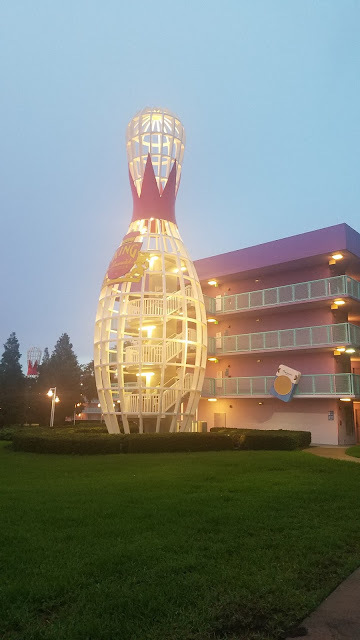 It's been a hot minute since we went to Disney in August, but I realized I never shared our thoughts on Disney's Pop Century Resort. I will admit, I was a bit nervous. 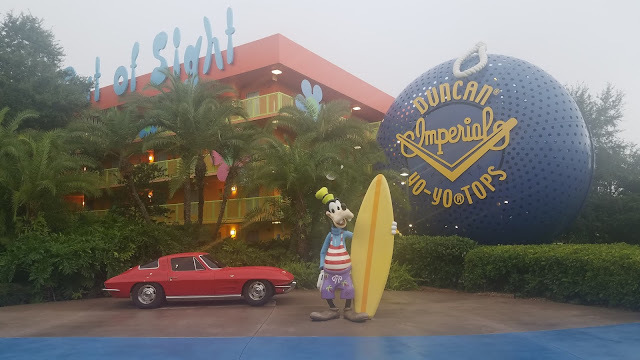 Last time we visited Disney, we stayed at a moderate level resort and Pop Century is considered a Value level resort. 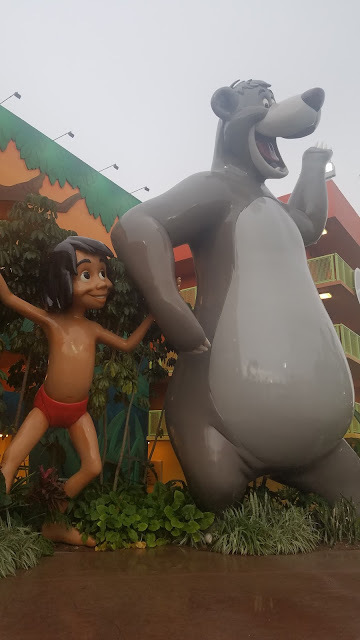 I know it's Disney, but still... 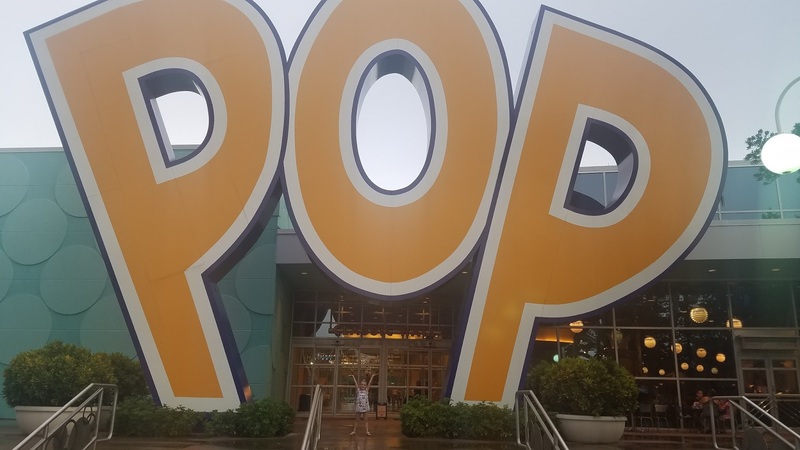 I was nervous, afraid of a subpar hotel and oh my gosh, I was so wrong. We loved the Pop Century Resort! 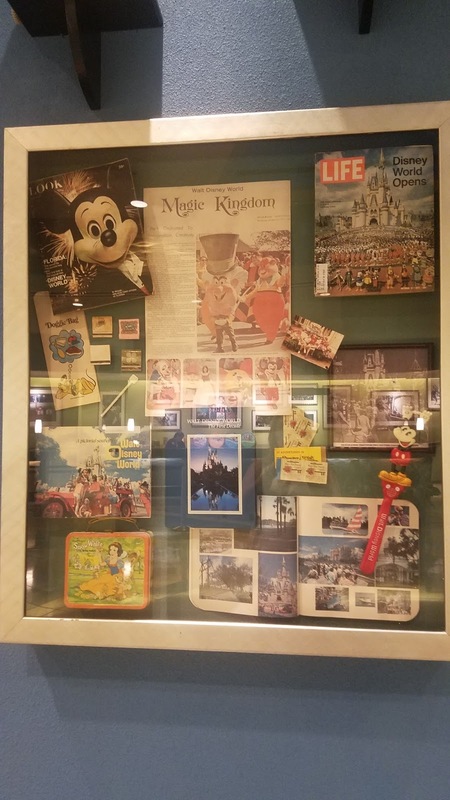 Even the check in area was lined with vintage and retro memorabilia that made me say oooh a few times! 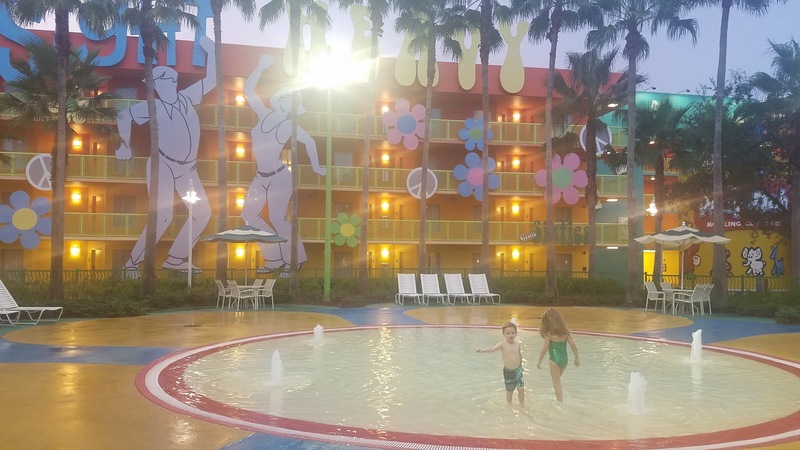 At first, we were a little sad that we did not get put into the newly refurbished rooms (construction is currently underway) but since we were right in the main pool area, and we only spent like 7 hours total sleeping in the room each night, we got over it pretty quick. 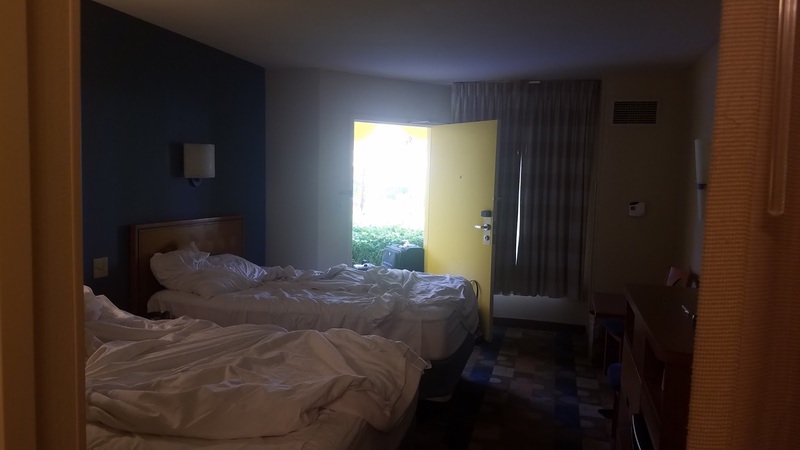 The room was the perfect size for the 4 of us: 2 beds, a large closet area and a bathroom door that shut and left the vanity area accessible was perfect in the morning. The beds were comfy and there was even enough room to park the double stroller! 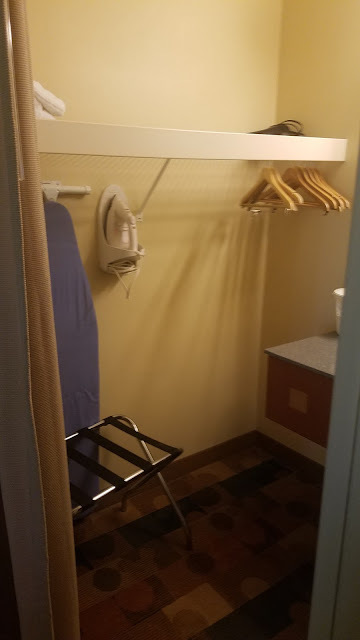 The best part of our room was where it was. Our room was extremely close to the main lobby, which meant we were very close to the game room, the dining hall, and Everything Pop Shop - which was perfect when we wanted a quick snack and when David needed cough drops! However, the best part for me, was being literal steps from the pool. Our ground floor room door literally opened right to the pools. 10 steps and we were at the gate for the kiddie pool/splash area, which was empty more often than not! 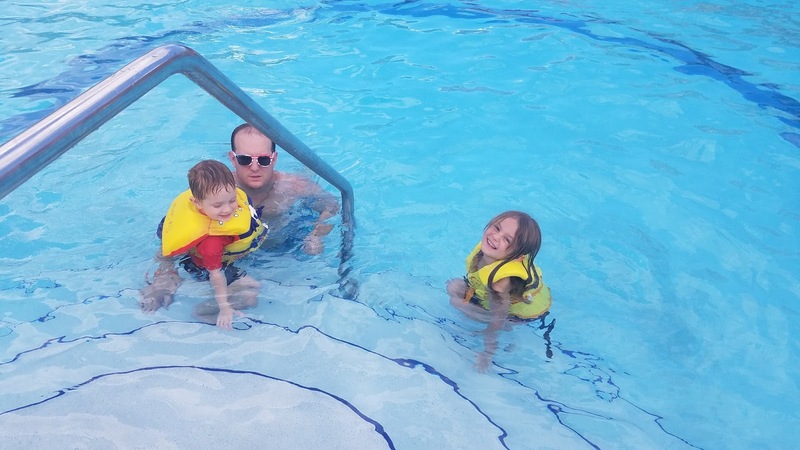 This was perfect for our kids who can't quite swim yet but still wanted to splash and have fun! We did take advantage of the big flower shaped pool and the pool bar as well! The resort also had laundry facilities and a walkway to the Art of Animation (which we explored!). 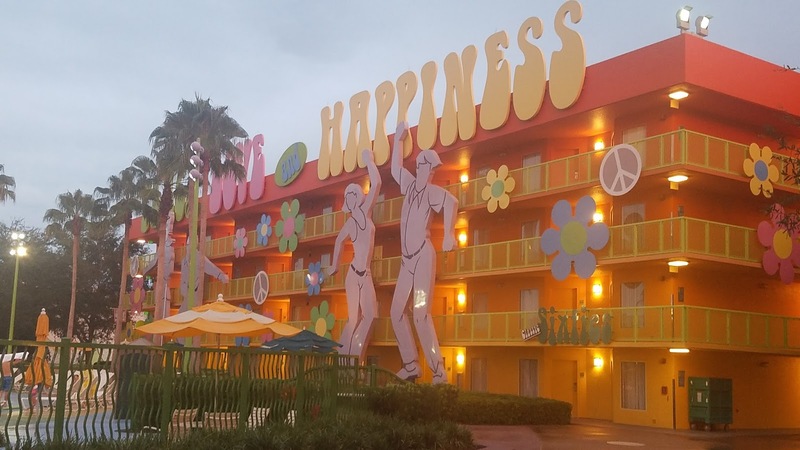 Honestly, if I didn't know it was a Value resort at booking, I would not have known! 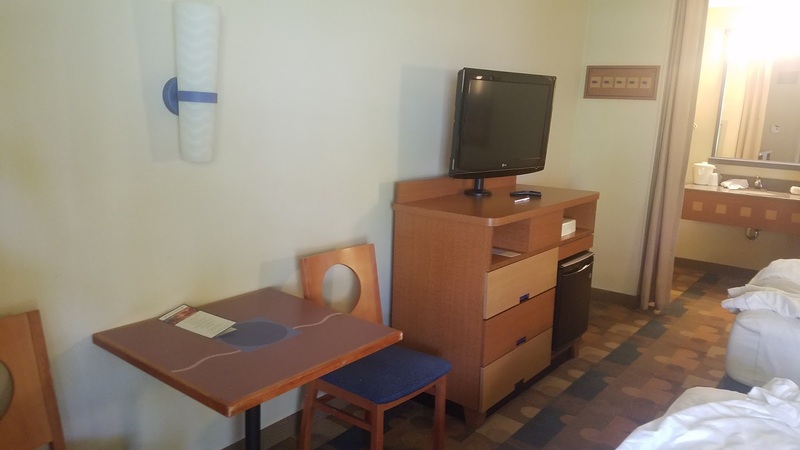 We loved how comfortable it was and how close everything was to our room! We'll absolutely be staying again when we visit Disney World next time! Few things are loved in our house more right now than Shopkins. 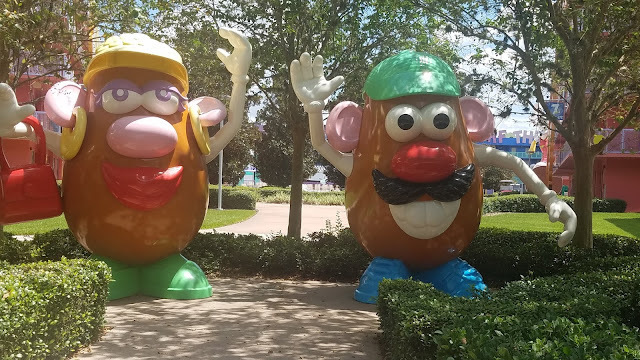 They are everywhere. 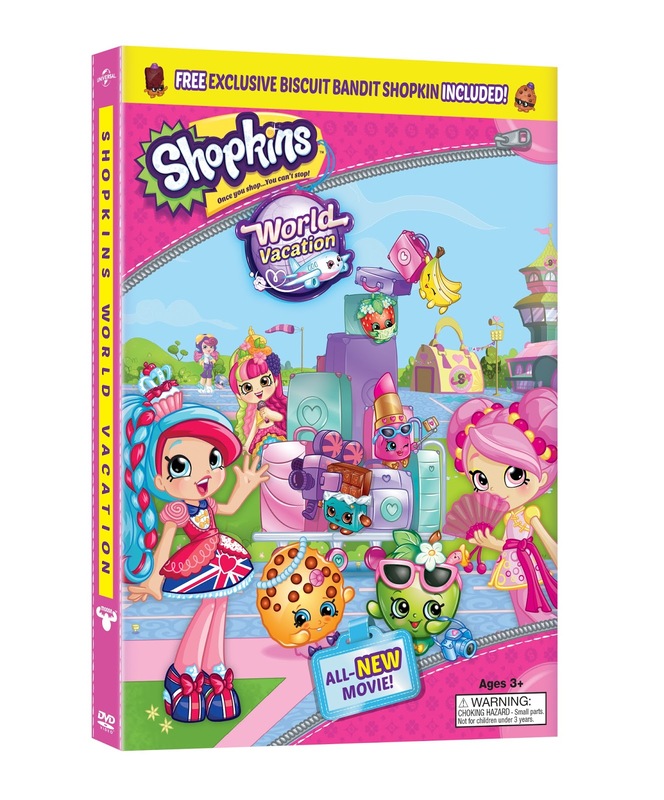 Our house has Shopkins coloring books, tshirts, pajamas, figures, streaming shows, and now, a DVD! Emmalee was beyond thrilled to receive the new Shopkins World Vacation movie in the mail! The DVD says "Kooky Cookie win the trip of a lifetime to London, but it’s not long before plans start going awry… soon Kooky Cookie and her pals are hopping from Paris to New York to Tokyo. 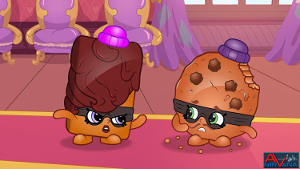 But with the mischievous Biscuit Bandits on the loose, can the Shopkins and Shoppies save the day?" 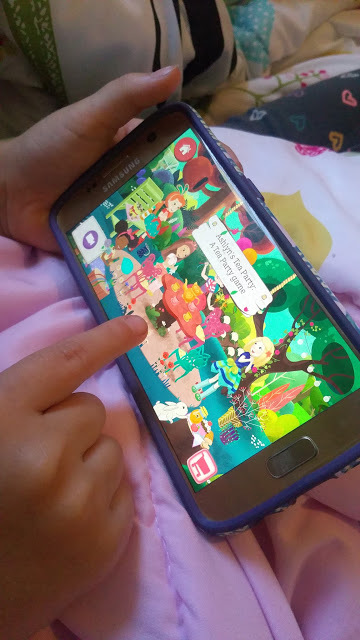 We knew it was going to be great, especially since we loved Shopkins: Chef Club last year! We had a rainy day yesterday so we grabbed our passports, some popcorn, and cozy blankets and piled up on the couch. I knew my girl would love it, but I was surpirsed by how much my 3 year old loved it! 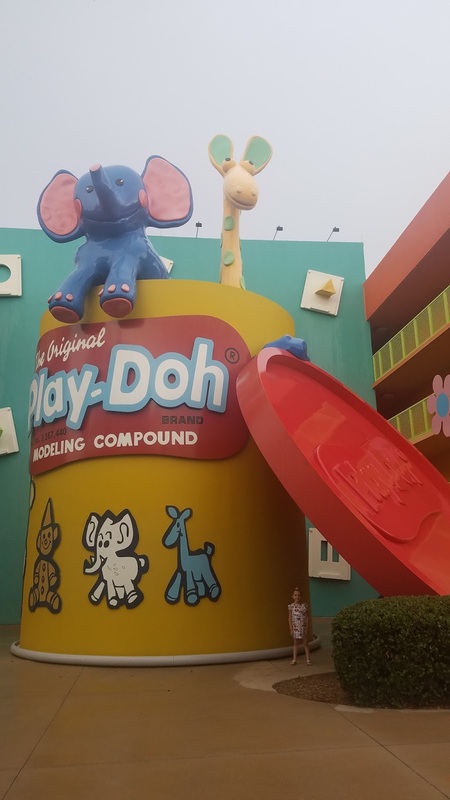 He kept asking us to go back to when they meet Pinkie Cola and he loved the "bad guys"- they're just as funny as bad, but still made me kids nervous about what would happen next! The movie is full of adventures and laughs, and even a few icon scenes that you may recognize! 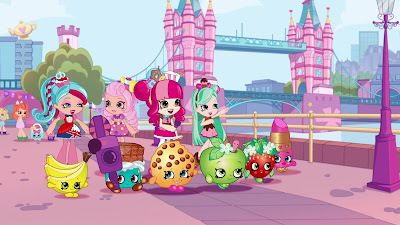 Emmalee loved the movie and since watching it has requested every single one of the Shopkins World Vacation Dolls and the Season 8 Plane so she can take them all on adventures! Obviously one of the first playsets on my list is the Oh La La Macaron Cafe-- France is Emma's favorite! You can pick up your own copy of Shopkins: World Vacation as a digital copy (available now!) or the DVD version (available the 17th!) from Amazon. Did you know that in addition to coffee and mac and cheese, Halloween is another one of those things that everyone else seems to love and I just don't? 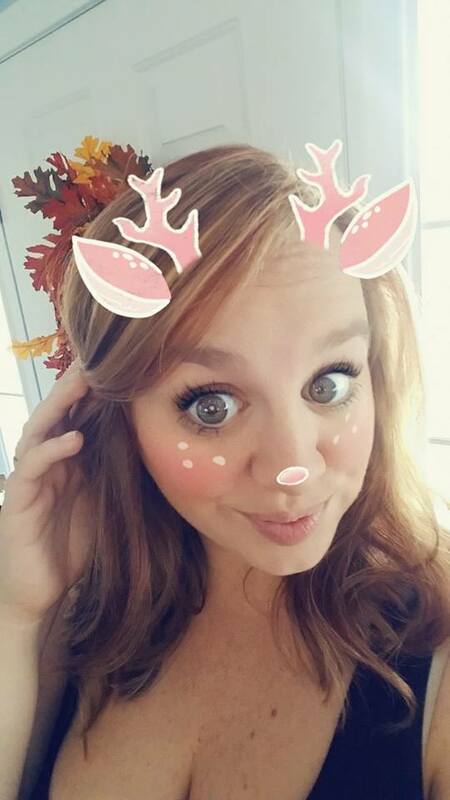 Literally, my ideal Halloween now is taking my kids Trunk or Treating somewhere lit, where we're not walking on dark roads, and then coming home to watch It's the Great Pumpkin Charlie Brown and Hocus Pocus while having a glass of wine and enjoying the candy I bought for the trick or treaters we never get. 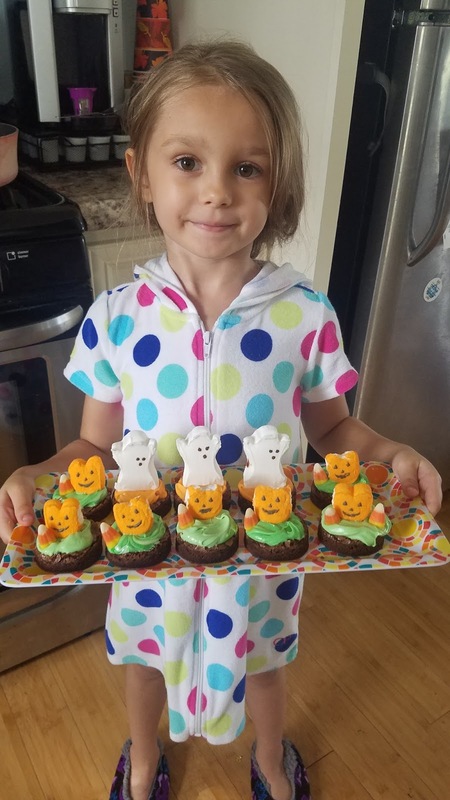 I will admit though that my children love the idea of Halloween. Costumes, treats... they love it! 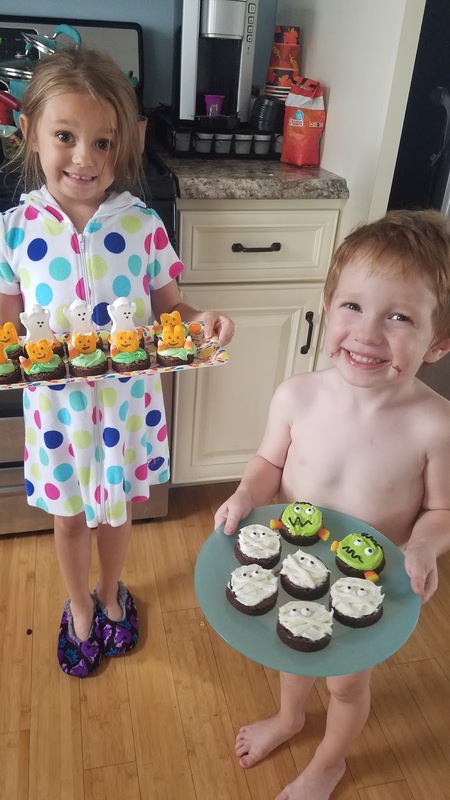 They spent most of Saturday morning in their Halloween costumes and kept pretending to trick or treat around the house. I figured a good distraction was cooking or baking something since they love being in the kitchen. I've been hankering for brownies lately so a quick boxed mix and the extra ingredients was an easy fix. I used a shallow 13x9 pan and baked according to the directions. After letting them completely cool, we used our amazing circle cutter set (the same one we use for making our own Uncrustable sandwiches!) to make smaller circle brownies. Last week, we picked up some ghost and pumpkin shaped marshmallows, as well as some candy eyes, so we knew they'd be the perfect decorations! Simple food dye to some frosting gave us some color and the kids enjoyed adding the marshmallow toppers. 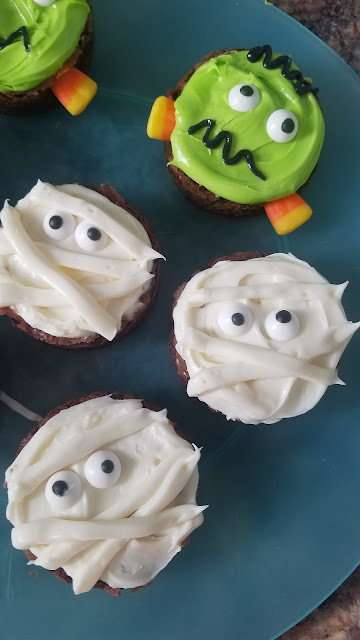 For the mummies, we frosted them with white, added 2 eyes, and then (using a sanwich bag with a hole cut in the corner) we added some lines to look like the gauze! 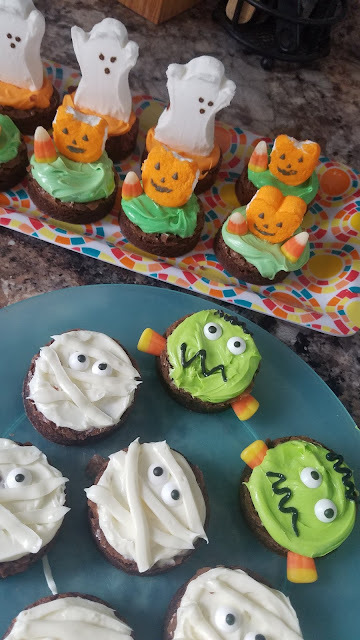 Frankenstein was easy as well: green frosting, 2 eye candies, and black decorating icing for the hair and mouth. We even added two candy corn for his bolts! 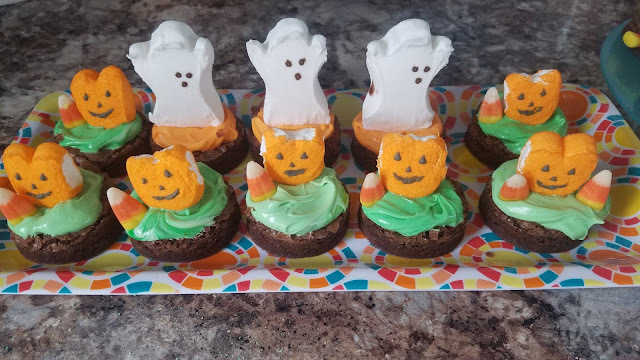 I think they're adorable and were so easy to make!